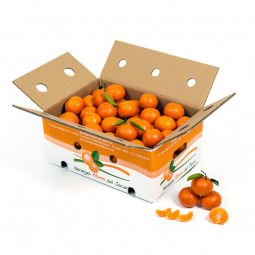 Tangerines come out in 10 Kg boxes. Their peel is thin and have no seeds inside. Their taste is really sweet and refreshing, easy to peel off, due their peel detaches easily with our hands to get their clusters directly. Well suited to eat out from home, as desert, snack or picnic. It is the sweetest candy, perfect for "among meals" eating.